The vehicles were operating, John thinks, in the Flint/Mold area, but where was the actual depot? It looks as though the railway arches are being used. Two Foden steam lorries which seem to be registered M 858 and M 836. The next two look like single-deck omnibuses, probably bought secondhand from London, judging by their registration numbers. The last two are similar omnibuses, but double-deck. The registration numbers might be "LC" followed by three numbers. Although they often appear in photos, the LNWR didn't have many double-deckers and they were all allocated to Watford, Brownhills, Mold or Llandudno Junction. North Wales had exclusively CommerCars by 1914, with Milnes-Daimler, Leyland and Daimler at the other depots. CommerCar really only got going after about 1907 and their radiator was described by one contemporary magazine as being "like a Milnes-Daimler", which makes identification of photographs very difficult, especially as the LNWR bought some very similar double-deck buses from each of them! In 1911 the CommerCar radiator shape was changed from "the angular type to a simple transition curve". Whilst I am no expert, I believe these to be post-1911 CommerCars, even though the drilled cross-member in front of the radiator is rather Leyland-ish. I also believe that fits with their being bought secondhand from the L.G.O.C. 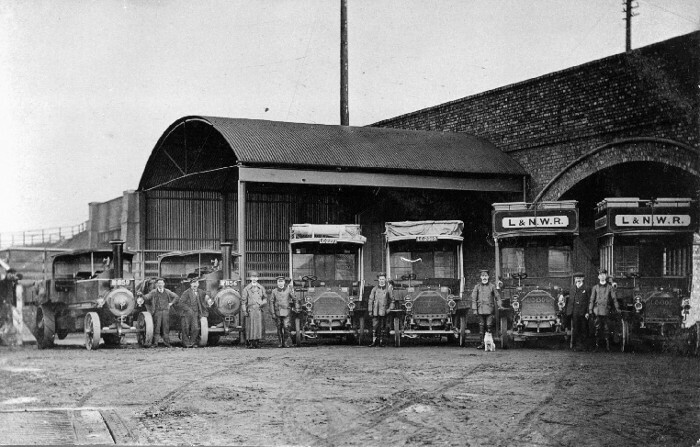 The photograph cannot be after 1914 as passenger services were suspended in that year and after the War the LNWR Motor Department concentrated on goods and parcels vehicles. If I am correct about them being CommerCars, then the date is 1911-1914. John Alsop is correct regarding the possible area being Mold/Flint as the last bus on the right as you look at the photograph is the one I have attached as further proof of possible location. My one other thought is Holywell Junction, as there was a bridge over the main line at the Chester end of the station. This would fit in with the photograph (plate 59) in Chester to Holyhead Railway by V.R.Anderson and G.K.Fox. Might I suggest Connah's Quay, the bridge in the background being over the WM&CQ line. I should have included this information originally. The buses are LC2277 and LC2819, Milnes Daimler 18 seaters with budywork by Didson. The other 2 are LC1306 and LC 1305, as before but 34 seaters. I would stick with Holywell Junction. The bridge over the Chester & Holyhead line (carrying a road to the minor dock) consists of plate girders, but the approach to the rail bridge proper consists of a series of brick arches. See also Fig. 34 in Chester to Holyhead Railway by Anderson & Fox. Yes, definitely Holywell Junction! It’s on the Down side, between the overbridge and the station approach. I have just looked at the 1912 Edition of the O.S. 25" (1:1250) plan on www.old-maps.co.uk and it all fits. The shed, the raised landing behind the vehicles and the slope leading up to it (extreme left), even the weighbridge at the bottom left corner. It's not on the plan in the book because it was built after then. Provision at the station for Motor Omnibuses was authorised by Passenger Traffic Committee Minute 8352 on 17th May 1905, including re-arranging the coal yard and shortening a siding to make space.